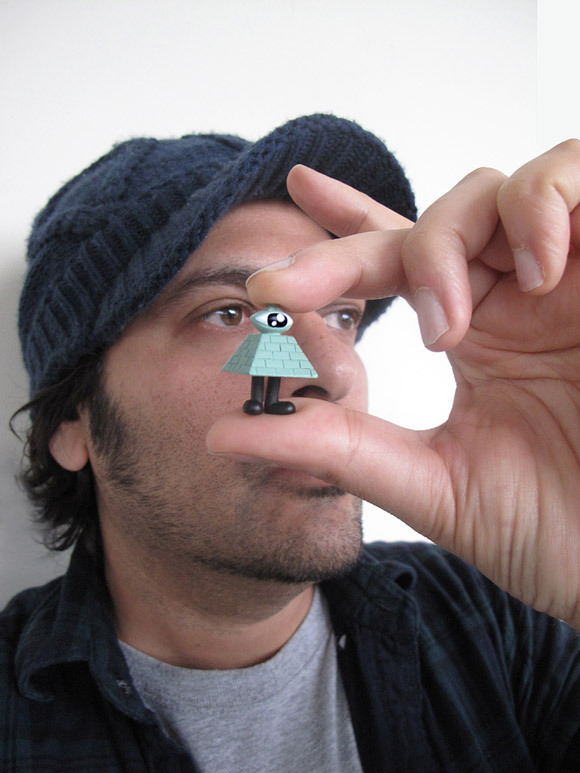 Kidrobot’s benevolent dictator, Paul Budnitz sat down with Austrialian artist, Jeremyville to pick his brain about his ideas behind today’s new release, Thoughts in Jeremyville. 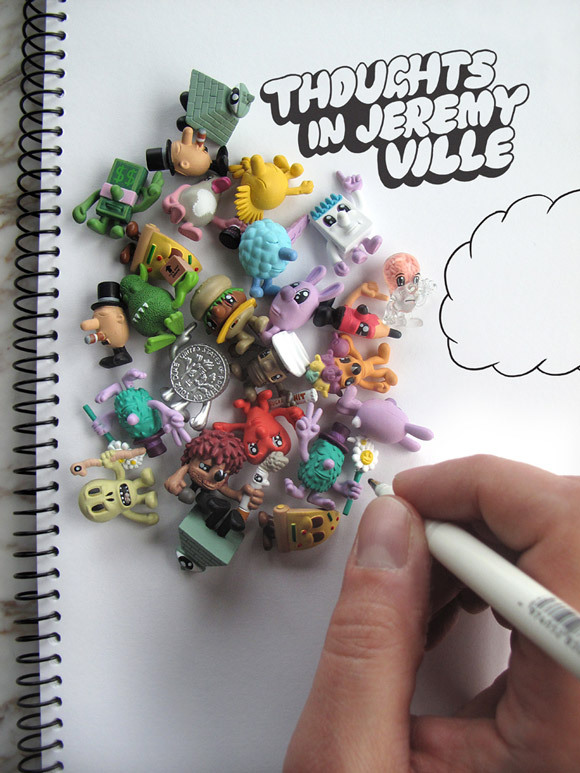 PB: The Jeremyville Thoughts mini-mini series just came out with Kidrobot, and I’m here to interview you about it. So, what were you thinking when you thought of the Thoughts? J: It all happened in a cafe on the Lower East Side. I opened my mind one afternoon and random thoughts tumbled out onto the sketchbook page. Kidrobot collected the fragments, crystallized them, and made them into little toys. 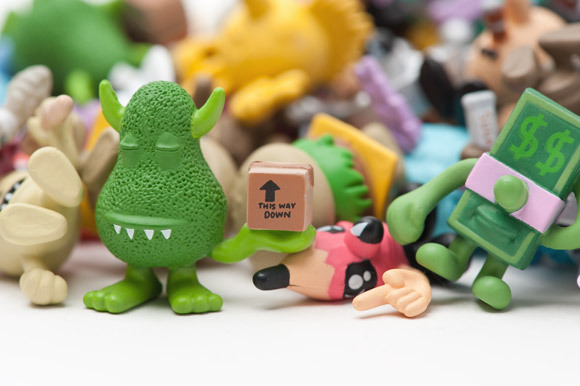 PB: This is Kidrobot’s first mini-mini series. Why did you decide to make them 1-inch tall? J: I’ve always loved cereal packet toys, and I really wanted to go for that vibe, but with a darker edge to it. You don’t usually find a skull carrying an earthworm in your morning cereal bowl. I really wanted to make that happen. Kidrobot helped make that nightmare a reality. Thank you Kidrobot. It’s also a really intimate and personal size, something so small and jewel-like – little vignettes of my mind. They are very small pop icons that depict very big subjects like Love and Death. It’s very bold to be very small. I used to build dioramas as a kid: little model towns populated by miniature figures. One day I might build a miniature model Jeremyville town and have these figures hanging out on the street. PB: What’s your favorite character in the series? J: The more abstract ones like the Secret Society (which I based off the pyramid with the eye on the dollar note – it has always intrigued me and scared me a little at the same time) and the Unknown (which is an enigmatic furry dude carrying a sealed cardboard box, with an arrow pointing upwards saying ‘This Side Down’). Both figures happen to be green, too. Green, to me, is a mysterious, far away color. PB: I have a giant poster of yours called “The Streets of Jeremyville” here in my house. It’s a compressed vision of Jeremy’s New York City that is both nightmarish and wonderful. Is that where you came up with some of the characters like ‘Latte’ and ‘Sketching’? J: Ah great, the print has found the perfect home! Yeah, I spend quite a bit of time in New York in the gritty Lower East Side, at the local cafe or at Schiller’s, just drawing and hanging out with my latte and sketchbook. I like that empty time when anything can happen in my mind. That’s the place where the Thoughts series was born. I drew the concept in half an hour or so, then a few days later, Megan from Jeremyville and I met with the awesome team at Kidrobot in their New York office, and I’m so glad you really dug the idea, and it all grew from that one precise moment. PB: One thing that I’ve recognized over the years of making toys with Kidrobot is that it’s actually extremely difficult to make a coherent mini-series of toys. What’s very hard is that each piece has to work by itself, because when you open a mystery box you want to be delighted by what’s inside. But the toys have to make sense as a group, too, so if you have a bunch of them they look and feel great together. J: Totally agree. Good point. The figures needed to work individually, as if they were stand alone figures, and are strong enough to possibly be done as individual 8-inch toys. That way they contain a whole story and universe within each toy, but they also need to fit into the context of a series. I also love the fact that a real team effort made this series happen, and that we were there at that first conception! I remember the meeting in that boardroom. I had the initial idea in my sketchpad, but you first identified the series, gave it the green light, and the team at Kidrobot made it a reality. Kidrobot tweaked it, modified sizes, gave suggestions, sent through images for approval and changes; the process is not for the feint hearted. It’s all a part of the long, beautiful and winding road of toy making, but with Kidrobot, the time flew because I was having fun. Never once was it a chore. And then, on a clear blue-sky day, the first boxes arrived at my studio in Bondi Beach Sydney, and it was like playing with a new born baby, in this case 20 of them. It’s like from that first moment of drawing the idea, to seeing the finished toy, took only 5 minutes, but it actually took 2 years! J: Well actually, I was invited to Beijing last year for a big art event, where I ate quite a lot of Peking duck. I think that was the motivation for that one. I began tallying up all the birds I had eaten over the years, lining them up in a row and asking for their forgiveness. So it could be a toy about becoming a vegetarian, for those that want it to be, but I still love the taste of flying things. PB: What about ‘Daydream’ and the zzzz’s? J: I decided to make the zzzz’s of Daydream solid, so that although the figure is like a nebulous cloud of midday fluff, his ideas and daydreams are quite tangible and made real. It’s a lot like I am: I can be quite abstract and random at times, but when I put my mind to something and work hard, it soon becomes a reality, and as solid as the zzzz’s. PB: Why does ‘Sunshine’ have a Mohawk? J: They’re like rays of the sun, but made into a punk haircut, which gives the Sunshine dude a rebellious, free spirited vibe. I guess the sun would be quite free spirited, it answers to no one. I also had it throwing a peace sign, to counteract the anger of the Mohawk. So it’s like a ‘quiet revolutionary’. This figure is about that incremental growth within us. Or it’s just a little yellow toy. Take your pick. PB: What’s the ‘Uptown’ dude about? J: He’s a cigar smoking, top hat wearing Upper East Side pillar of society, just stepped out from his private gentleman’s club on Park Avenue. Something I’ll never be, so I guess I made a toy about him to remind me of the opposite of a scruffy Lower East Side, latte drinking artist from Bondi Beach in Sydney. PB: Why is ‘Lucky Dollar’ crossing his fingers? J: Hoping for an end to the recession I guess. He’s like the mascot for the crash of 2008, and the hope for things to improve in these tough times! Place him near your bed each night and he’ll bring you more luck by the morning. PB: Does the ‘Secret Society’ figure have something to do with this too? I went to a college where there were all kinds of creepy secret societies. Actually, it was the people that were in them that were creepy. PB: There seem to be some yin and yang figures in there. J: Yes, there are opposites like ‘Love’ & ‘Death’. Or ‘the Hangover’ & ‘Sunshine.’ I actually also think some figures pair up well, like ‘Your Dime,’ and ‘Lucky Dollar,’ or ‘Sketching’ and ‘Ideas,’ and ‘Freedom’ & ‘Daydream’ – those 2 are like buddies hanging out together at an outdoor festival in my mind. And ‘Uptown’ and ‘Secret Society,’ who go hand in hand. PB: Do you play with your own toys? J: I’ve always played with toys since I was a kid; I haven’t yet found a good enough reason to stop doing it. I invented characters and imagined worlds to amuse myself when I was a young kid, now I’m at the age when I can make those worlds real, and invite everyone to come and play with me. How awesome is that. That kid still inside me never had it so good.